Ever wonder how the amazing cast of kids on Stranger Things landed their roles? Well, now you can watch their original auditions. (Parts, anyway.) Better still, we get to see two of them react to their own auditions. In the lead-up to the release of Stranger Things 2, Netflix made an odd announcement: that the show would gets its own after-show. It was odd because typically these kinds of shows analyze the events of the episode just released, but since Netflix drops entire seasons rather than weekly episodes, how exactly would this work? 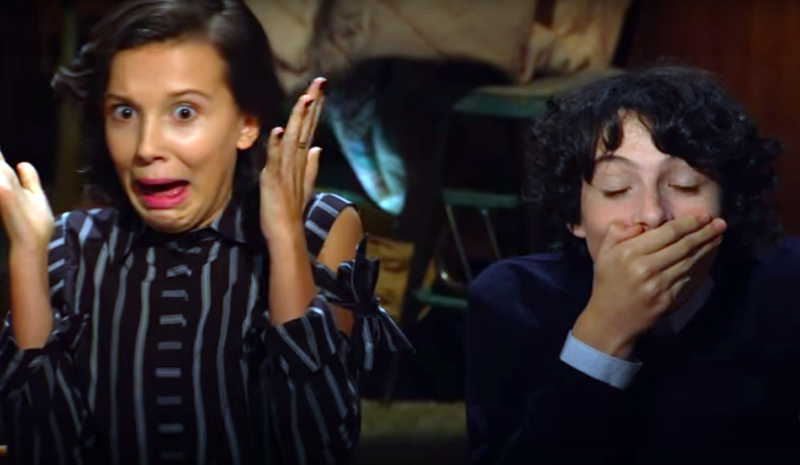 But anyway, the show, called Beyond Stranger Things, sets out to “explore the inspiration for the series, tell behind-the-scenes stories and analyze every aspect of the second season, including answering all burning questions.” In one particular episode, the hosts break out a surprise for stars Millie Bobby Brown and Finn Wolfhard: the cast’s old audition tapes. One fun tidbit: You might recognize when Schnapp, who plays Will Byers, asks, “Am I weird?” Yup, that’s a Gordy LaChance line from Stand By Me. It feels absolutely perfect that a show set in the 1980s would audition its kids by having them read lines from a classic 1980s movie about kids in the 1950s.